Boasting its own natural beauty, this area in the southwestern section of the county consists of large rural sections that are both fertile and partially wooded.While springs and autumns are surprisingly brief, winters are long, with successive storms that ensure there is usually a cover of snow on the ground. However, winter temperatures frequently climb above freezing, allowing snow and ice to melt. This repeated freeze/thaw cycle can exacerbate any damaged areas of asphalt, such as cracks, while the runoff from the melting snow can seep through the cracks and erode the foundation. Any water trapped beneath the asphalt surface can then refreeze and cause additional damage. Sealcoating, Marlton, NJ, should be considered. Sealcoating, Marlton, NJ – APS Is The Premier Asphalt Company In Marlton, NJ! Summer months do not provide a great deal of relief for asphalt surfaces in Marlton, NJ. Frequent thunderstorms can drench parking lots and allow water to flow freely into any openings, such as cracks or potholes, in the surface. Once water penetrates to the foundation, the integrity of the asphalt surface can be severely compromised if the water erodes or otherwise destabilizes the foundation. Considerable damage can be done that can require costly repairs. Because asphalt pavement in Marlton, NJ is subjected to a great deal of abuse by the weather, proper maintenance is essential to prolonging the asphalt’s life. Maintenance includes repairing any cracks that might appear as quickly as possible, with a sealant applied afterward to give the asphalt additional protection. At Asphalt Pavement Solutions, we have been helping our customers with their asphalt-related needs for more than 30 years. We provide a complete line of asphalt maintenance and repair to the Marlton, NJ area as well as cities throughout New Jersey and Pennsylvania. At Asphalt Pavement Solutions, and we perform all the work ourselves without resorting to sub-contractors. This means you will always know who will be arriving on your site to perform the job. Whether you need asphalt crack sealing, Sealcoating, Marlton, NJ the professionals at Asphalt Pavement Solutions can help. For a free quote, you can use our online form to send us your information, or you can call 1.856.461.1710, 1.856.544.3990 or toll-free at 1.800.559.SEAL. Asphalt Pavement Solutions unmatched quality and customer service doesn’t stop with pavement markings. We offer complete pavement maintenance for all size businesses. Asphalt Sealcoating – Protect and extend the life of your pavement with a quality sealcoating. Just like a wooden deck, or any other surface exposed to weather, asphalt can be protected to maximize its natural life cycle. Sealcoating protects pavement from the sun’s harmful UV rays, chemicals, and most importantly water. Learn more about asphalt sealcoating in Marlton, NJ! 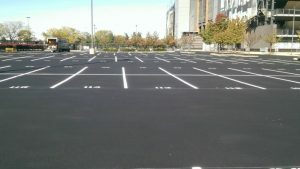 Asphalt Repair – Protecting the underlying structure of your asphalt parking lot is the sole purpose of asphalt maintenance and repair. Once asphalt ages it may be necessary to perform asphalt crack repair or more serious asphalt repairs. By sealing cracks and addressing issues such as potholes early on, you can save many thousands of dollars in extensive repairs and paving. Learn more about asphalt repair in Marlton, NJ. Asphalt Paving – The rich black, and velvety smooth surface typical of quality asphalt paving compliment your commercial or industrial property’s architecture and serve as an elegant welcome mat for your visitors and potential customers. Asphalt is easily maintained, costs less and can be more quickly repaired (sometimes in less than an hour) than other types of pavement. If access to your business or commercial property is critical for your business or residential community, choosing asphalt paving is a no-brainer. Learn more about asphalt paving in Marlton, NJ! APS is the pavement maintenance expert in Marlton, NJ. Call us at 1-800-559-Seal or fill out the Free Job Quote form for a no-obligation consultation with one of our asphalt experts.